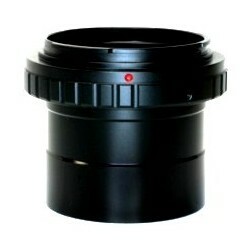 2" Prime Focus Adapters There are 13 products. Fits all Canon EOS SLR/DSLR Cameras. Our True-2™ UltraWide Adapter is a true 2" prime focus adapter that takes you directly from the bayonet mount to a 2" barrel with as few wasted photons as possible, adding as much as 10mm additional clear aperture over legacy adapters! This 3 Piece Set fits all Canon EOS-M Mirrorless cameras. You must have a telescope that accepts 2” Eyepieces/Accessories to use it. Includes: A Canon EOS-M Mirrorless T-Ring, a 2” T-Threaded Low Profile Barrel and a Glass Dust Filter to protect your camera sensor. Fits ALL Nikon SLR & DSLR Cameras. Our True-2™ UltraWide Adapter is a true 2" prime focus adapter that takes you directly from the bayonet mount to a 2" barrel with as few wasted photons as possible, adding as much as 10mm additional clear aperture over legacy adapters! This 3 Piece Set fits all Nikon "1" Mirrorless cameras. You must have a telescope that accepts 2” Eyepieces/Accessories to use it. Includes: A Nikon "1" Mirrorless T-Ring, a 2” T-Threaded Low Profile Barrel and a Glass Dust Filter to protect your camera sensor. Fits All Sony E-Mount Mirrorless Cameras. T-Minus takes it's name from that fact that it is shorter than the "T" standard. T-Minus adapters are over an inch shorter than T-Ring solutions, for reflector owners this means you can likely reach true prime focus for the first time. 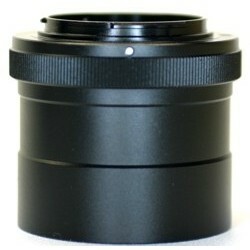 Fits: Sony NEX E-Mount Mirrorless Only. Our True-2™ UltraWide Adapter is a true 2" prime focus adapter that takes you directly from the bayonet mount to a 2" barrel with as few wasted photons as possible, adding as much as 10mm additional clear aperture over legacy adapters! Fits Olympus PEN, OM-D & Panasonic/Lumix "G". T-Minus takes it's name from that fact that it is shorter than the "T" standard. T-Minus adapters are over an inch shorter than T-Ring solutions, for reflector owners this means you can likely reach true prime focus for the first time. Fits Full Size Olympus 4/3 Cameras. Our True-2™ UltraWide Adapter is a true 2" prime focus adapter that takes you directly from the bayonet mount to a 2" barrel with as few wasted photons as possible, adding as much as 10mm additional clear aperture over legacy adapters! This 3 Piece Set fits all Fuji “X” Mount mirrorless cameras. You must have a telescope that accepts 2” Eyepieces/Accessories to use it. Includes: A Fuji “X” Mount T-Ring, a 2” T-Threaded Low Profile Barrel and a Glass Dust Filter to protect your camera sensor. This 3 Piece Set fits all Samsung NX cameras. 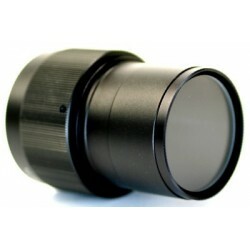 You must have a telescope that accepts 2” Eyepieces/Accessories to use it. Includes: A Samsung NX T-Ring, a 2” T-Threaded Low Profile Barrel and a Glass Dust Filter to protect your camera sensor. Fits All Fuji X Mount Mirrorless Cameras. T-Minus takes it's name from that fact that it is shorter than the "T" standard. T-Minus adapters are over an inch shorter than T-Ring solutions, for reflector owners this means you can likely reach true prime focus for the first time.